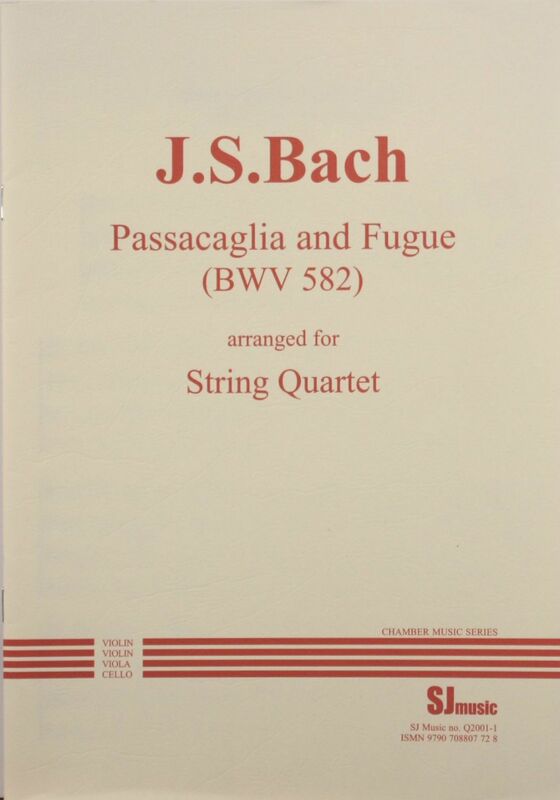 Bach would almost certainly have approved of this arrangement of his organ work (BWV 582) for string quartet by John Cooley, as it conveniently has four contrapuntal parts, and he was well known for making arrangements of his own works, according to instrumental resources at his disposal. Moreover, the parts mostly fit well within the ranges of violin, viola and cello, although notes have been raised by an octave in a few places. This quartet version is therefore simply the four parts written out separately, following Bach’s original version note for note. It is quite “notey” but straightforward and accessible technically to reasonably good players as there are no tricky rhythms or high notes. As well as this organ piece arrangement, SJ Music has also published John Cooley’s arrangements of Mozart’s piano duets K497 and K521 for piano trio and piano quartet respectively, Bach’s concerto for violin and oboe for string quartet, and one of Purcell’s trio sonatas for string trio.